"This has probably been the most significant weather event to hit Texas," said ARRL South Texas Section Manager Lee Cooper, W5LHC. "We have had major tropical storms and hurricane events, but the widespread combination of heavy rains, tornadoes, and flooding all at same time and covering two-thirds of the state, is pretty much unprecedented for us." Click here for SKYWARN and ARES reports on the responses to these severe weather events across the south-central part of the country. Happy 50th Anniversary to the Hurricane Watch Net. The Hurricane Watch Net (HWN) celebrated its 50th anniversary on the air, June 13-14. HWN members used the call sign WX5HWN, operating on 14.325 MHz but with stations active on or near 7.268 MHz as well. More here. ARRL Emergency Preparedness Manager Mike Corey, KI1U, reminds ARES members that ARRL HQ needs reports and updates on ARES activities related to severe weather responses, and any responses for that matter. This information is important for several reasons: recording ARES activity for ARRL reports, updating national partners on our activity, and identifying any needs in the field. Please keep HQ in the loop on activities of ARES groups (and others, eg, SATERN, MARS, amateurs assisting VOADS). Please remember to complete the reporting form FSD-157. Reports can easily be made on-line here. Click here for the new ARES Manual. As reported in last month's issue, the ARES Manual and NTS Manual have together long been part of a single publication, the Public Service Communications Manual. The two manuals will now be separate publications. NTS leadership is currently reviewing and preparing to update the NTS Manual. The new ARES Manual includes several new additions: inclusion of ICS forms 213, 205, and 214 for ARES use; an expanded discussion on training resources; clarification of the role and purpose of RACES; and copies of all current ARRL MOUs. The update is the first in over two decades and was a collaborative effort of field organization leaders, federal partners, and ARRL staff. The new manual is available online as a downloadable PDF. The ARRL 2015 Hurricane Season Webinar is scheduled for Monday, July 20 at 8 PM eastern time, and will run for approximately one hour. Agenda items include welcome and introductions, a report from the National Hurricane Center Station WX4NHC team and VoIP Hurricane Net, ARRL Public Information, Canadian Hurricane Center, Hurricane Watch Net, and ARRL HQ Hurricane Response. More details to come. Don't miss this opportunity to discuss hurricane season plans and issues with leaders from the Amateur Radio hurricane response community. ARES members from all three Florida ARRL Sections (Northern Florida, Southern Florida, West Central Florida) participated in a statewide hurricane response and communications exercise on May 30, a day prior to the start of the 2015 hurricane season, which runs from June 1 to November 30. Florida is the 20th largest state (by land area) and third largest state by population, in the US, and is exposed hurricanes, and other severe weather such as tropical storms and tornadoes. The objectives of this exercise were to evaluate current procedures, identify areas for improvement, and achieve a collaborative posture with partner-agencies. A major goal was an assessment of the ability of players to establish and maintain multi-disciplinary communications networks during a response to a hurricane incident. Assessment of hurricane preparedness was also an exercise objective, with adequacy of plans for responding to a potential Category 3 hurricane land fall addressed, including issues of resource management, and information control. During the exercise, players responded to simulated events and information as if the emergency was real, unless otherwise directed by ARES leadership. ARRL Northern Florida Section Manager Steve Szabo, WB4OMM, exhorted his ARES team members to "have fun, work with your peers, and think creatively." Informal post-exercise debriefings with local ARES groups were held to assess local group needs, individual operator needs and amendment/modification of ARES emergency response plans as indicated. Players and their leaders were advised to conduct exercise activities within their staffing capabilities and procedures according to their local plans. Reporting forms were mandated to be ICS/NIMS compliant. Communications modes were primarily RF-based, and not overly dependent on Internet hybrid systems, although hybrid platforms in common usage were to be tested, including D-RATS, Winlink, and others. Power sources were battery/generator-based, independent of commercial mains. 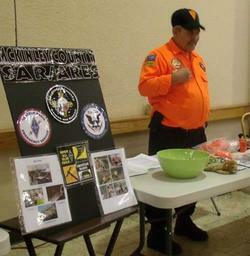 ARES groups were tasked with activating and staffing their local EOC (real or simulated); and deploying members to any two partner-agencies (hospital, fire house, shelter, police/sheriff office, Red Cross, Salvation Army, church, school or any entity facility in the local community served by the group). Once on site, ARES exercise players established communication links via an RF-based mode (on HF, VHF, UHF, with CW/FM/SSB/data modes). Operators obtained the name of their served agency, its street address and point of contact (POC) information (name and position/title) and provided it to the county EOC on a NIMS compliant message form (ICS-213) via the RF communications mode. In turn, operators at the EOC then checked-in to a net such as a Florida traffic/ARES net, SARNet, Florida State-Wide Hurricane Net, or used an Internet-assisted mode such as D-STAR, D-RATS, Winlink2K, SEDAN, or others to send the information and a test message listed in the communications plan, and SITREPs to county ARES Emergency Coordinators (EC). The EC in turn sent activation, deployment locations/POC information, check-in data and messages to the Section Emergency Coordinators (SEC) as a SITREP. Summaries of all exercise results were to be forwarded to the Florida State ESF-2 (Emergency Support Function #2 -- Communications) Coordinator at the State EOC in Tallahassee before the end of the day. Although reports are currently being received and compiled, Section Manager Steve Szabo, WB4OMM, reported that the exercise was a success from his perspective in part "because we found some things that didn't work" to address and correct for possible real activations this season. Section Emergency Coordinator Strait Hollis, KT4YA, is compiling a section-wide after-action report. Initial exercise observations included propagation challenges on the Northern Florida Net on 80-meters, mandating turning to the net's alternate frequency on 40-meters. Net Manager Mac Ardle, W4NFG, managed the changes to keep the net going. A key ARES asset, the Orange City Statewide Amateur Radio Net (SARNet) UHF repeater was down, preventing many counties from using it. The Statewide Amateur Radio Network (SARnet) is a network of linked UHF voice repeaters that serves the State of Florida. "The key to what makes SARnet work so well is that this network uses dedicated bandwidth that is separate from the Internet," noted from its website. Some messages using some modes did not go through, and more message handling training for operators is indicated for the future. Szabo concluded that all operators learned something from the exercise, and noted the great numbers of groups and operators participating. An After Action Report/Improvement Plan is to be distributed by the end of July. ARRL Southern Florida Section Manager Jeff Beals, WA4AW, and Section Emergency Coordinator Larry Zimmer, W4LWZ, reported that five major Southern Florida Section counties participated in the Statewide Hurricane drill, including Broward, Indian River, Lee, Martin and Palm Beach counties. 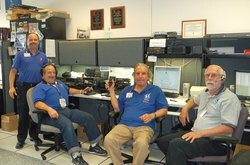 Broward county ARES/RACES operators activated their VHF network, exercising their local nets. Operators also made contact with the State EOC in Tallahassee on the SARnet. A challenge that could not be overcome was to contact the State EOC on HF, and solutions will be worked out. Indian River county ARES/RACES participated in a tabletop version of the exercise with their county emergency management team. Lee county ARES/RACES operators were able to establish contact with the state EOC on HF from the Lee County EOC. Martin county operators activated their EOC and Red Cross facilities. They were able to make contact with the state EOC both on SARnet and on HF. Palm Beach county ARES/RACES operators checked into the State EOC net on HF and on the SARnet from the Palm Beach EOC. ARRL Assistant Section Manager Randy Payne, K4EZM, is currently compiling reports of activity from the section surrounding Tampa, on the Gulf side of the Florida peninsula. Darrell Davis, KT4WX, Section Manager of the ARRL West Central Florida Section, noted the critical, on-going process of working out a framework for how all three ARRL Florida Sections will interface with the State EOC during hurricane situations. "A great second meeting at the Orlando Hamcation in February was held to continue that process," Davis said. "All three of us (Jeff, Steve, and myself) think of our three Sections as three branch offices of the same organization." "That is the way it should be; we get together whenever we have the opportunity," Davis concluded. Collaboration and cooperation, working together, is in evidence in the state of Florida. The National Hurricane Center Amateur Radio Station WX4NHC conducted their Annual Station Test on May 30. This is the 35th year of volunteer public service by the WX4NHC Group at NHC. WX4NHC operators conduct this event each year in preparation for hurricane season, which started June 1. The station was tested on many frequencies and modes, including HF, VHF, UHF, and Winlink, VHF/HF APRS, EchoLink/IRLP/All-Star, e-mail and on-line forms sharing. All operators and communications systems performed well. hurricane. It was also a good opportunity for National Weather Service (NWS) field staff to become aware of the unique capabilities of Amateur Radio during severe weather and disaster situations, when conventional communication modes fail. WX4NHC was on-the-air for eight hours. Contacts were made and surface reports were received from many stations throughout the US, Canada, and countries in the Caribbean, Central and South America. The VoIP Hurricane Net on (IRLP node 9219/EchoLink WX-TALK Conference node 7203) worked perfectly and hosted many contacts. More than 40 D-STAR/D-RATS Surface Weather Reports were received at WX4NHC. The D-STAR//D-RATS net and reporting was coordinated by John Davis, WB4QDX. WX4NHC managers are excited of the potential posed by D-STAR/D-RATS modes that can produce hurricane surface reports in formats readily used at WX4NHC. These reports may someday fill in a very important gap in surface data during a hurricane that could not be garnered through other modes. Cupertino ARES/RACES (CARES) provides emergency and public service communications to the City of Cupertino, California, and adopts a professional approach to training and exercising, responding and embracing the latest in technology. Let's take a look at their exercise models, from its website, with the permission and courtesy of Jim Oberhofer, KN6PE, Emergency Coordinator for the city group. To ensure response processes work, CARES complements its training activities with exercises and public service events. These activities work well in helping test tools, processes, and procedures with the goal of fine-tuning them as necessary. Preliminary Safety Assessment (PSA). This is a field exercise that tests our ability to effectively pass a fixed-formatted message from the field to the EOC. The PSA process provides a Cupertino EOC with an early snapshot of potential damage immediately after an infrastructure-shaking event, thereby helping the city with their response priorities. This drill is based on a city Preliminary Damage Assessment Procedure. Infrastructure Safety Assessment. This is a full field deployment exercise where CARES members locate and report on critical infrastructure assets of our partner/served agencies with the goal of verifying the asset's state. Once the asset is inspected, its condition is reported to the EOC and the agency. This drill is based on a city Infrastructure Safety Assessment Procedure. Field Communications Deployment. These are field deployment exercises where CARES members are sent into the field to provide communications support. The exercise may indicate deployment to one of the city's CERT incident reporting points, shelters, medical centers, or as a shadow assignment (where a communicator stays with an official to assist with message handling). Assignments may also result in deployment to a location to make actual or simulated observations based on a plausible response scenario. This drill is based on a city Field Assignment Procedure. EOC Operations Support. This activity is usually performed in conjunction with any field deployment that takes place. Its purpose is to orient responding CARES members with our roles and responsibilities when assigned to the EOC, the different radio equipment used on the Cupertino Comm Van, and the kinds of interactions CARES may have with the EOC staff. Emergency Communications Station Exercise. This exercise is to test CARES' ability to establish and operate a communications facility that could be used to support the city with backup field-based local and long distance communications during an emergency or disaster. This drill also coincides with the ARRL Field Day event, which is the weekend of June 27-28 this year. As the role of Amateur Radio in emergency communications continues to evolve, both Harris County (Texas) ARES and ARRL South Texas Section leadership are constantly working to provide current, relevant training to the ARES membership to keep up with the changing requirements and needs of partner agencies. Training includes the FEMA Independent Study courses IS-100, IS-200, IS-700, and IS-800. To be in an ARES/RACES leadership position, individuals may also take the IS-300 and IS-400 courses. Additional coursework is also indicated, such as the ARRL Amateur Radio Emergency Communications Course (EC-001) and even the Public Service and Emergency Communications Management for Radio Amateurs (EC-016) for leadership positions. Locally, each South Texas ARES district leaders provide weekly on-the-air training that is tailored to the environment, conditions and needs specific to the section and district. Harris County ARES has implemented a training program with all four ARES units conducting the same training approximately 20 times per year. This program is now being carried over to the entire section where all districts will conduct a similar regimen of training sessions. In addition, the South Texas section now publishes a personal training workbook for individual operators that outlines training requirements and encourages members to demonstrate their skill sets to their EC and have skills checked off/documented in their workbooks. In order to facilitate this process, a number of Saturday training events will be held, with the first session held on Saturday, May 23, 2015. It was attended by 25 Harris, Fort Bend and Galveston county ARES members who received training on Anderson Powerpole assembly, demonstrated their ability to field program an H-T radio with repeater offset and tone, and completed and sent an ICS-213 message form. ARES is alive and well in McKinley County, New Mexico. ARES there is embedded with the County Search and Rescue (SAR) organization that has 27 active members, 15 of whom are Amateur Radio operators. Also included in the membership is a rope team, two medical doctors, a nurse-practitioner with a search dog, four EMTs and a paramedic. The group is supported by a local Med-Flight helicopter transport service to assist in quick searches of remote areas, and triage. this consortium, response times have improved from hours to minutes. The SAR/ ARES members take the same training as volunteer firefighters and rescuers. Training includes radio communication tracking, use of ropes in rescue, emergency medical procedures and wilderness first aid. To keep in practice, the group works numerous public events each year, providing communications, emergency medical assistance and off-road transport for participants in bike races, motocross events, and the annual Gallup Balloon Rally. The group has participated in searches for lost persons and has provided communications for Fire/Police/Medical personnel and even the FBI in a forensic evidence collection case. In February, 2013, a hiker fell off of a cliff, landing on a narrow ledge 30 feet down that was still 100 feet above the ground. He called for help on his cell phone and his approximate location was determined by triangulation on the cell phone signal. Fire Department personnel searched the area, finally locating him high above on the ledge. Dan, KE5FYL, Team Leader of the Rope Team that finally rescued the hiker, studied maps and considered advice of the locals who knew the area, enabling the team to get positioned above the subject. Rescue gear was divided among Dan's five man team: long ropes, short ropes, a pickoff harness, webbing, carabiners, and rappel devices. "I used my 2 meter radio to keep us in contact with the rest of the team via a local repeater during our climb," Dan reported. Finding a way up to the top of the mesa above the stranded hiker in the dark was difficult and took several tries, backtracking and scouting different approaches each time. The team used a rope to belay members up at a few spots. The most agile climber in the group was sent up a short technical section with a couple of spotters, and then he found a good anchor for himself, wrapped the rope around his body, and belayed the rest of the team as they climbed up. Once on the top of the mesa, Dan's team moved to the target coordinates, could see the lights of the rescuers below the subject, and found the subject's foot prints. "We followed them down the easy part of the cliff, and got to a good spot directly above the subject," Dan said. The subject was on a one and a half to two foot ledge about twenty feet below the team. It was decided to send one rescuer down to the subject to make an assessment. Another rescuer sat on the edge, talking to the subject, while the rest set up an anchor and ropes. A rescuer took a jacket, the pickoff harness and a helmet, and was lowered to the ledge. He attached the pickoff harness to the subject, and attached it to the rope. Getting the subject down was priority number one; he had fallen so there was a risk of spinal injury, but did not have any altered sensations in his extremities. He was cold. An assessment and plan were quickly adopted, and the rescuer traversed the ledge with the subject to a point directly below the anchor, and they weighted the rope. The rest of the team on top of the cliff lowered them down. The subject was taken to the hospital for evaluation, and did not sustain any substantial injuries. The ARRL Eastern Pennsylvania Section has long been one of the most active sections in the country. Recent events there prove that this is still the case. York County EC Sandra Goodman, N3ECF, reported on the May 3 Multiple Sclerosis (MS) Walk in John Rudy Park, York. Thirteen operators participated for the three-hour period. Operators placed at strategic locations around the mile long course monitor for medical and other problems with walkers. Three operators walked the course, embedded with the participants. Operators can call for assistance quickly. Thirty operators supported the YMCA York Marathon on May 13. The event is a qualifier for the Boston Marathon. Several operators worked as Net Control and at the Finish line, including aiding the announcer by providing runner numbers as they approached the finish. Operators are placed at nine water stations along the 26-mile route. Two operators on bicycles followed the runners, watching for any incidents. Because the terrain makes it difficult for all locations to reach the local repeater, a rail trail portion of the course was divided into three zone nets. Each net covered three or four locations, with operators communicating via VHF simplex. Each Zone net then communicated with the Main Net Control at the Finish in York City via the VHF repeater. Operators track the first and last runners in each direction, and at the end of the race, advise event directors on other runner movements. (Incident Management Unit), which was used as a Command Post for communications and was staffed by Amateur Radio operators, Sullivan County EMA and Pennsylvania EMA personnel. The Montgomery county EMA brought Special Unit 630 and a portable trailer-mounted tower for use at one of the Aid Stations. Communications were handled using the State of Pennsylvania's OpenSky network with Amateur Radio 2-meter communications systems as back-up. A portable 2-meter repeater, provided by the Bald Eagle Repeater Association, was used to extend coverage throughout the mountainous terrain. - Thanks to ARRL Eastern Pennsylvania Section Emergency Coordinator W.T. Jones, W3LUZ, for compiling and forwarding these reports. Broadband data networking via Mesh is picking up speed in areas of the country. The Santa Clara County (California) ARES/RACES has published a page of related presentations, documentation, training and resources that is current as of June 15, 2015. A link to a presentation on Amateur Radio Data Networking for Event/Incident Communications is included. Check out the group's activity and page here. I had the good fortune of having lunch with busy ARRL Northern Florida Section Manager Steve Szabo, WB4OMM, last week. Steve is a whirling dervish: He's a law enforcement professional and emergency manager here in Volusia County, Florida, and a traveling trainer for ICS/NIMS compliance with the US Department of Homeland Security. As busy as he is, Steve is engrossed in and committed to his job as ARRL Section Manager. He travels across his section almost constantly for club meetings, hamfests, and emergency management and other meetings. Our ARRL section is geographically large, a section that includes the Orlando, Jacksonville, and Tallahassee metropolises, and almost countless tiny rural farm towns that dot the northern Florida landscape of agriculture, forests, springs, and rivers, bordered by two oceans. Steve is a renaissance man in terms of his operating interests: a DXer, contester, active on VHF, UHF and HF using voice, CW and data modes. Steve has a good understanding of volunteer management and human nature, and is a good "people person." We talked about the challenges, problems, issues and concerns faced by today's Section Manager, from ARES program recruitment, to volunteers' understanding and embracing of our roles in working with partner agencies in emergency management, and public safety. Thanks for lunch, Steve!